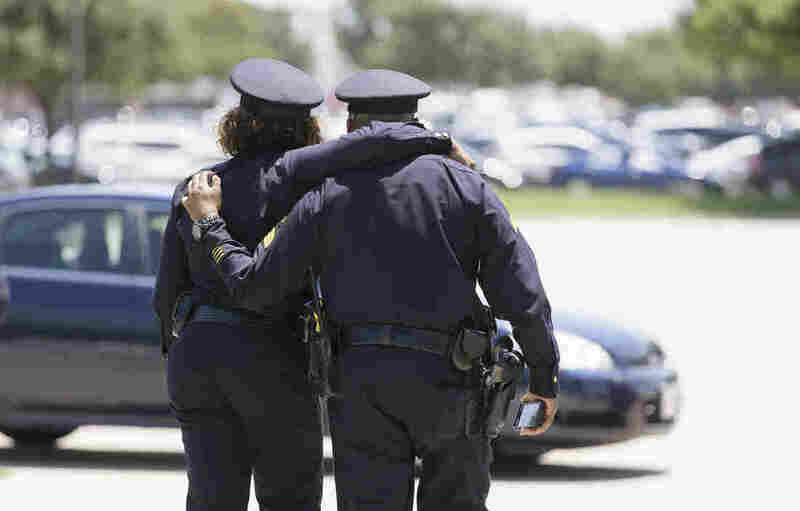 Many Cops Under Tremendous Stress After High-Profile Killings It's a difficult day for law enforcement officers after the killings of police in Dallas and Baton Rouge, La. For many officers, tensions are high and morale is low. Dallas police officers comfort each other after the funeral for Dallas Police Senior. Cpl. Lorne Ahrens at Prestonwood Baptist Church in Plano, Texas, on Wednesday. Ahrens and four other officers were shot and killed during a protest two weeks ago in downtown Dallas. It's a warm and muggy summer afternoon in Chicago, but that doesn't seem to bother the kids clamoring to ride the Ferris wheel, the Rock-O-Plane and other carnival rides set up in this southwest suburban park. At the annual Chicago Fraternal Order of Police summer picnic, city cops and their families hauled in coolers and set up grills to enjoy food and bond with brothers and sisters in blue. But there's something hanging over this picnic: the stress and strain of the job, and the scrutiny that many here say is harsher than ever. Police across the country were already shaken, mourning the loss of the five officers in Dallas killed by a sniper last week. And then the police killings in Baton Rouge, La., happened. The deadly attacks on law enforcement, and the recent killings of black men by police, have many wondering if the relationship between the police and the communities they serve will get worse before it gets better. "We're being judged for every little thing. And when it gets portrayed, the story only shows a portion of it, and nobody wants to end up that way," says one officer at the picnic. 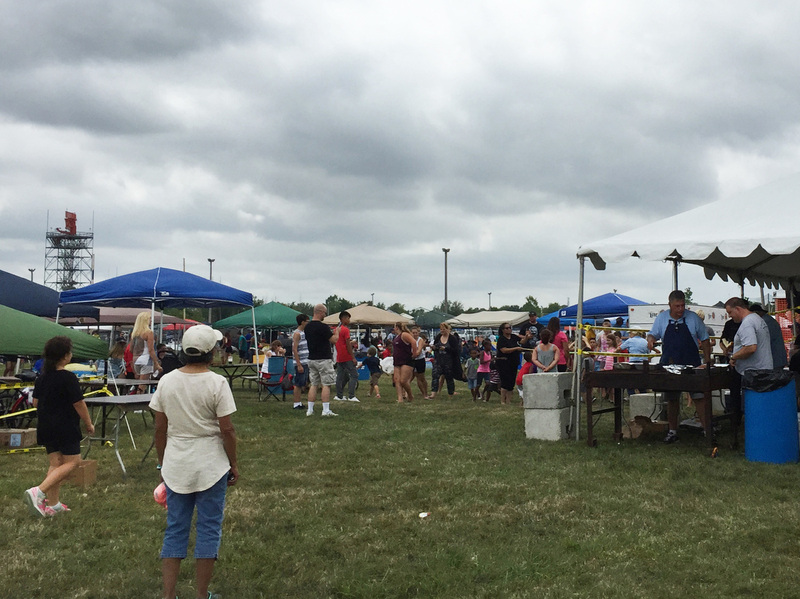 The annual Chicago Fraternal Order of Police summer picnic for city cops and their families. The FOP allowed willing officers to talk with NPR for this story, only if they were not identified by name. Chicago in particular is a city where tensions are high and police-community relations are poor. Shootings are up in the city; the number of homicides is higher than any time since the '90s. A white, middle-aged 15-year veteran of the city's gang crimes unit laments that despite all the work it does, all of the attention seems to be on the few incidents police get wrong. "And it's disheartening to see what's happening with us and how, I hate to say it, the media and the politicians are dropping it all on our backs and pointing the blame on us," the officer says. "It's just a shame." Morale, he said, continues to drop. "I wish I'd have stayed in school," he says. "My kids wanted to be the police. I'm definitely wanting them to go a different way." "If I could retire right now," the officer adds, "I'd be gone." What keeps this officer going are the friendships, trust and bonds he shares with his fellow officers. "This is all we got. I bleed blue," he says. "The majority of people I've ever worked with, I wouldn't hesitate going through a door." This picnic, in fact, is a chance for these Chicago police officers and their families to enjoy each other away from the stress of the job, sipping beers and cooking burgers over one grill, or turning thinly sliced and perfectly seasoned meat on another. A Latina officer who has had nine years in the Chicago Police Department is cooking carne asada. "It's very difficult," she says. "We're under a tremendous amount of stress." And that is stress this officer has a hard time leaving at work. "Let's just say I have a lot sleepless nights, replaying stuff in my mind," she says. "And I have little kids. And I can't bring that home. So you need to learn how to cope with it so that it doesn't start affecting your family. It's not easy." No matter how hard they try, many police families are even more on edge after the killings in Dallas and Baton Rouge. It's not just spouses who worry. "I fear for my sons. I have two sons that's policemen, so I say a prayer for them," says Gwendolyn Scott, another picnic attendee. Scott worries that all police officers are being painted with the same broad brush, because of the high-profile shootings of young black men. "'Cause all police are not crooked," she says. "Now, as a black mother, I'm upset that this is happening to our black men. And it's sad to say that it's white police officers that's doing this." Scott says she prays for the protection of not just her sons, but every citizen. "I'm tired of all the killing. I really am," she says. "And I'm not saying I want them to quit their job because we need policemen, we need protection. Only thing I can do is pray." Among African-American officers in particular, the strained relations between the community and the police are especially difficult. A 16-year veteran officer says there's a lot of anger out there. "Some people, you'd wave at them, they'd flip you the finger and you're just saying good morning," she says. So she tries to just shrug it off. "It is what it is. I mean the reality of it is, we spend most of our time encountering people at their worst," she says. "We don't usually encounter people at their best. There's usually an issue or situation." But this officer also says the events in Dallas seem to have brought about a better understanding of the dangers police face. That goes a long way for the many police officers who right now feel under siege. "I've actually had more people recently stop us on the street as we're working, saying, 'Thank you, we appreciate you, we're glad you're here.' "